Rook takes castle! But is it something that’s worth crowing about? Judging by the noise the chicks make, it would certainly seem to be. There’s a small wood behind the houses just up the road and there are a few tall trees in it. In one of the tallest there is a crow’s nest – at least that’s what we thought. At first, the sight of two large black birds and the sounds of loud raucous cawing seemed to confirm this hypothesis. But we now have photographic evidence – and pretty damning evidence it is too. Look closely at the photo and you can see quite plainly that the bird sitting on the nest has a white beak – the defining part of the anatomy that marks this bird as a rook – not a crow at all. What happened to the ‘Rooks and Jackdaws live together in large colonies’? 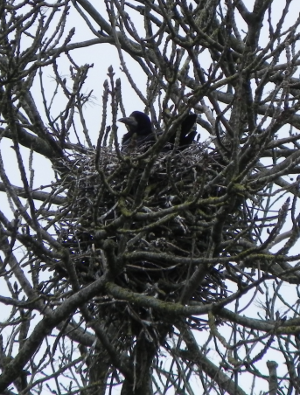 There isn’t another similar nest for hundreds of yards (or metres either) in any direction. Do these two not read any bird books? So what’s going on here? Have they been sent to Coventry by the rest of the flock? Are they a couple of snooty, stuck-up so-and-sos who just can’t bear to be in the same lifeboat as the working class riff-raff who live in the rookery? Is it just that they can’t stand the noise? Personally, I think they don’t trust those Jackdaws, and I for one don’t blame them.